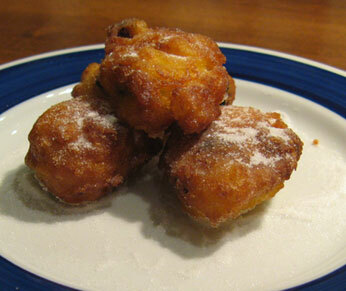 Frittelle di riso, fried rice fritters, are a Tuscan tradition for St. Joseph's day, March 19. Across Tuscany you'll find numerous festivals being held on this day to celebrate Italy's "father's day". In a sauce, heat up the milk, rice and salt. Cook until the rice softens and begins to fall apart; if you need to, add more milk during this time. Remove from heat and let the cooked rice cool down, even better if you cover it and put it in the refrigerator overnight. In large mixing bowl, combine the eggs, sugar, orange peel and flour. Add the cooked rice and mix well. With your hands form small balls and set aside. Heat your frying oil up, then fry the balls until all sides are browned, about 5 minutes. Drain on paper towels, then sprinkle powdered sugar on top.